What Is A Putter Tune-Up? I estimate that out of the entire golfing population, that 80% to 90% of golfers would benefit from some change in their putter that made it work better for them and consequently reduce their number of putts per round. 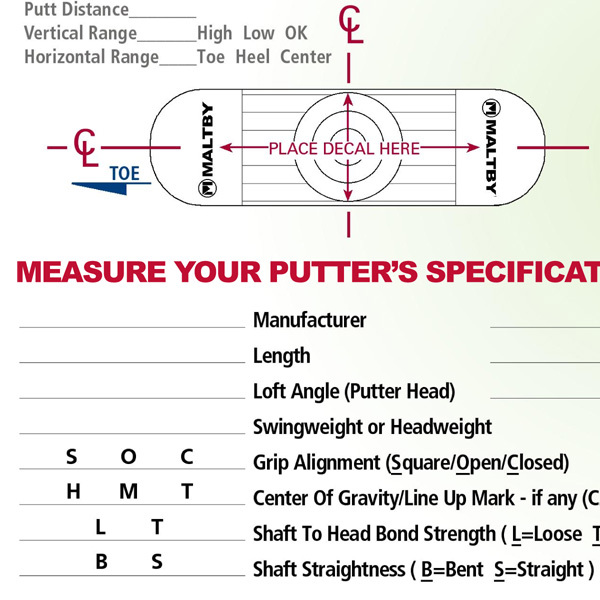 This means that measuring a golfer’s existing putter and recording all the important specifications and then doing a proper putter fitting and finally modifying some of those specifications would be a putter tune-up. It’s actually fitting a putter that does not fit the individual perfectly and not selling him or her a new putter. Now, in many cases, a new putter is the best way to go and sometimes the only way to go. This is what a tune-up will tell the club fitter or the golfer; but in correcting the existing putter, many golfers may get to keep their favorite putter. The two main reasons (although there are many more) that a golfer would need a new putter would be when the existing head weight is simply too light and there is no practical way to increase it. This can be more of a problem with the older end shafted blade or flange style putters which were manufactured with much lighter weights than we use today. The other would be if the putter impact decal reading clearly shows that a higher moment of inertia putter than the current putter would suit this golfer better because his horizontal ball impact range on the putter face is not very good. The good news about putter tune-ups is that the majority of changes to an existing putter to get it to fit properly will be to shorten its length and then this may create a need to modify the lie angle and possibly add a little more head weight. It is usually quite enlightening to do these tune-ups because it can turn up a number of what we would classify as little things such as a crooked putter grip or a bent putter shaft or even a loose putter head. One of my Maltby Rule of Thumbs is that as club fitters, it is our job to eliminate as many of the bad equipment variables that do not help us. So, a putter tune-up not only makes us check all these things out in our current putter, but it also provides a proper putter fitting and the necessary modifications to make everything work the best for us.